The wedding morning kicked off with preparations at the Bristol Royal Marriot Hotel. The boys had time to go out and buy cufflinks before getting dressed and making their way to the church. Meanwhile the girls had their own room and a huge breakfast feast from room service. With Emily and Stacey on hand to do hair and make up everyone was really relaxed. The camper van left to take the bridesmaids and Laura’s Mum leaving Laura and her Dad for a few quiet moments before heading off to the ceremony. Laura arrived at the church, Christchurch Clifton Down, and the ceremony got underway with lovely sunlight streaming the through the windows. The vicar dropped the rings, making everyone chuckle and helping them all to relax. Vows and rings successfully exchanged they signed the register and processed out. Then drinks were served in the church and guests stayed around to chat. There was a confetti tunnel to send us on our way to the suspension bridge for lovely photos of the newly weds and their families. It was a lovely day so there were lots of friendly onlookers and great views of the bridge. Then it was time to head on to the Paintworks for arrival drinks and greetings from their friendly staff team. Afternoon tea was served on cake stands to long tables of cheerful guests. The fairy lit space was full of chuckles as the speeches got underway- and a few tears were shed. 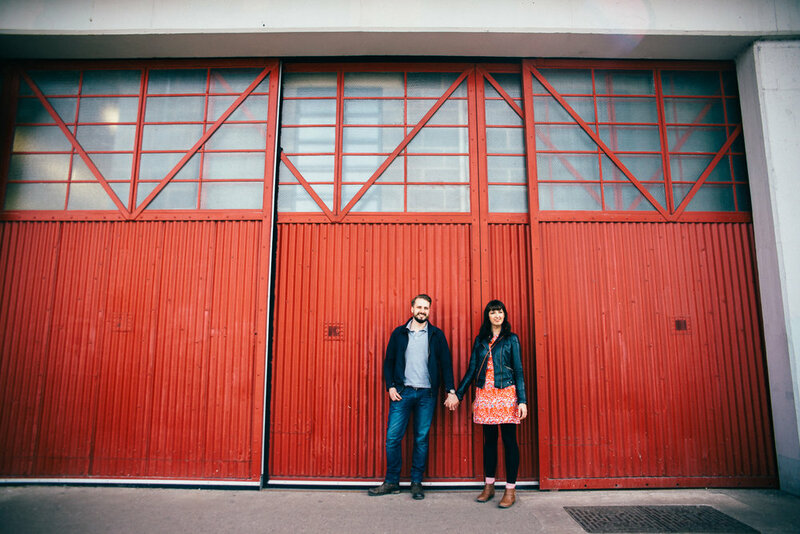 We snatched a moment for some couples shots around the Paintworks grounds- a great industrial space. We even ran into a granny themed hen do which kept us amused! Guests spent the evening between the courtyard and the dance floor. The kids were particularly keen dancers with plenty of funny dance moves and a spot of breakdancing. As the sun went down lots of people were happily chatting in the courtyard. We had the Photo Booth set up in a chimney- which proved popular. As did the mini fish and chips, and burgers and fries were served to keep us all going! There’s so much to soak up from this wedding, be sure to check out the photo booth below, the stop motion above and if you still want more click here for their engagement photos from Bristol Harbour.